Probably discovered by William Herschel on February 1, 1786. Discovered by E.E. Barnard around 1900. Barnard's loop is a remarkable nebula enveloping a great part of the huge Orion cloud, or complex, it seems to be associated with. 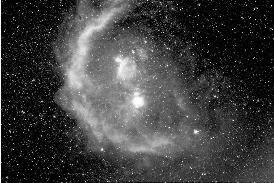 It was perhaps discovered by William Herschel on February 1, 1786, and finally found again by E.E. Barnard who called it "Orion Loop." While difficult to be observed visually, it can be well photographed on long exposures. It is speculated that this nebula may be a supernova remnant. This theory was brought up by Öpik 1953, but opposed e.g. by Menan who suggested it might be simply a diffuse emission nebula excited by hot stars. More recently it was found that this huge nebula is probably the ionized inner surface of an even larger hydrogen cloud envelopping a vast region of space which contains hot, ionized gas of low density, and the Orion OB1 association, a group of very hot young stars of spectral types O and B. This large "bubble" was possibly formed by a series of supernova explosions, perhaps about 3 million years ago. UV observations have shown that Barnhard's Loop is also visible in the ultraviolet light - as a reflection nebula shining in scattered starlight. The reflection of its dust particles is apparently most efficient in thtat part of the spectrum, and coincides with the maximal light intensity of O and B stars. Semi-recently, it was found that an even larger UV reflection nebula exists in this region of space, reaching far beyond Barnard's Loop. This nebula has an apparent diameter of over 30 degrees. 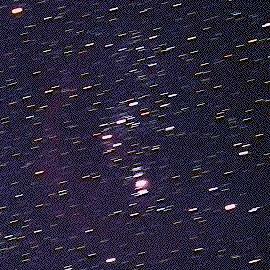 The image above was obtained by Peter Erdman, with a 35-mm lens at f/4, in the H alpha light; exposure time about 4 hours. Barnard's Loop stands out prominently in this image of the southern two-third of constellation Orion, as does the Orion Nebula region; M42 and M43 are clearly visible, as are the bright nebulae NGC 2024 (Orion B) and IC 343 in the Horsehead Nebula region. M78 is more difficult as it is inconspicuous in H alpha, but can be found in the large version of this image, which shows a lot of more detail in the fainter nebula. The bright star on the lower right in this image, just about at the end of the extension of the loop, is Rigel (Beta Orionis). The image on the right shows faint Barnard's Loop on a star trail exposure of constellation Orion obtained by Alexander Jäger of the Interessengemeinschaft Astronomie (Astronomy Interest Group) at the University of Constance. 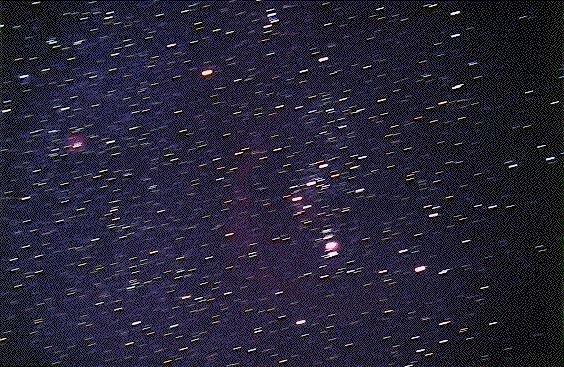 Other parts of the Orion cloud, such as the Orion Nebula M42/M43 and the Horsehead Nebula region can also be easily identified in this image, as well as Orion's major stars. The extended image shows also the Rosette Nebula. Alexander took this image with a 50 mm f/1.4 photo lens stopped to f/2, exposed 2 minutes on Kodak Ektachrome Panther P1600X film from the Schwäbische Alb, South Germany.